Posted March 3, 2007 in 2007/03, 6 Mainline, Foxhole, Periods, z Archive. With issue #6 Foxhole looses focus a little bit. The cover still declares it was made by veterans and, except possibly for one story, this is true. One change that occurs is that the credit boxes have disappeared. Once again we must rely mostly on the style to identify the artist. For the first time one story shifts completely out of the WWII or Korean time frame. None of this affects the quality of the comic as a whole. With one exception, all the stories are great reads, penciled by some of the same talented artists that we have seen before. Further Jack Kirby is back! Jack provides two stories and that alone makes this issue memorable. Only two things dampen my enthusiasm for this comic. One of the stories really is not all that good and the cover is way below Kirby’s standard. It is obvious that Simon and Kirby put much effort into their covers. I do not believe any other team or individual artist produced so many covers of such consistently high quality. Disappointing covers are very rare but Foxhole #6 is one of them. The last covers for Police Trap are also poor efforts. Even the last In Love suffers and that was drawn by Bill Draut. Bullseye #6 is a good cover, but the preceding one is not. So many below par covers from such a short period deserves some sort of explanation. I cannot offer a definitive one, but I suspect that the Simon and Kirby studio and the work practices it supported had broken down. A soldier gets wounded and separated from his unit during a commando probe of Germany held Dieppe. He is discovered by a Frenchman who hides him. The Germans take over the house to use as their headquarters effectively making the American soldier a prisoner. His hidden vantage point provides the soldier with the opportunity to observe the brutality of the German occupation. This is Joe Albistur’s last effort for Foxhole. He would continue to provide some stories for the Prize romances but after a couple months that would end also. Albistur only worked for Simon and Kirby for about a year. Although he did provide enough material that during that time he really can be considered one of the usual suspects (artists who frequently provided work for Simon and Kirby). Like the other usual suspects (Bill Draut, Mort Meskin and John Prentice). Joe Albistur has his own unique style which is easily recognizable. I previously have admired his work for the Prize romances but his Foxhole art has left me even more impressed. 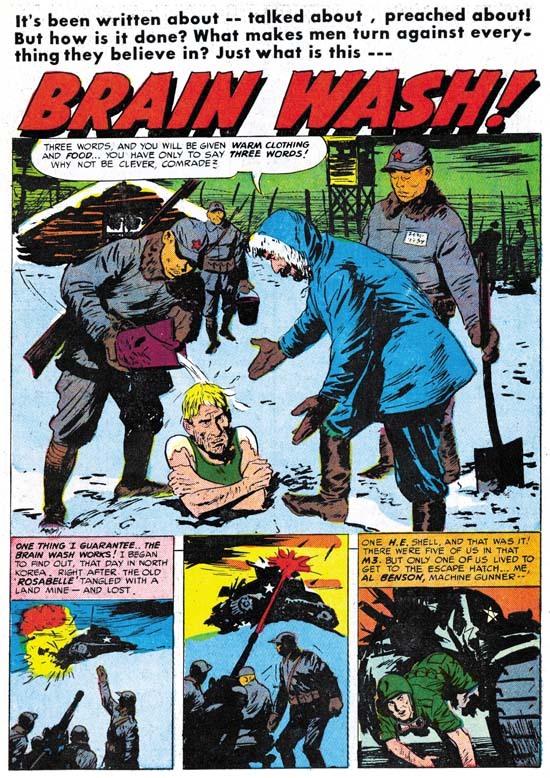 Joe would do further comic book work after his Simon and Kirby period. I have not seen much of that work and what little I have seen does not look as good as his S&K material. Is this because I just have not seen enough of it or did Simon and Kirby provide the kind of freedom for Albistur’s style to flourish? Without credits I cannot say who is responsible for the “Decision At Dieppe” script. 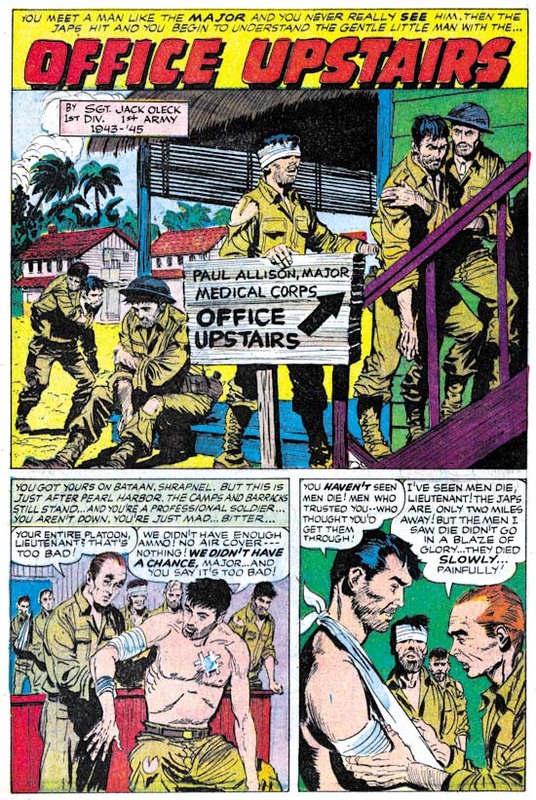 In previous Foxhole stories Albistur’s writers were Jack Oleck and Jack Kirby. I really do not have a handle on Oleck’s style yet, but the writing of this story does not appear to have been by Kirby. It is wordier then Kirby’s writing and reads more like the work by someone with a writers background. 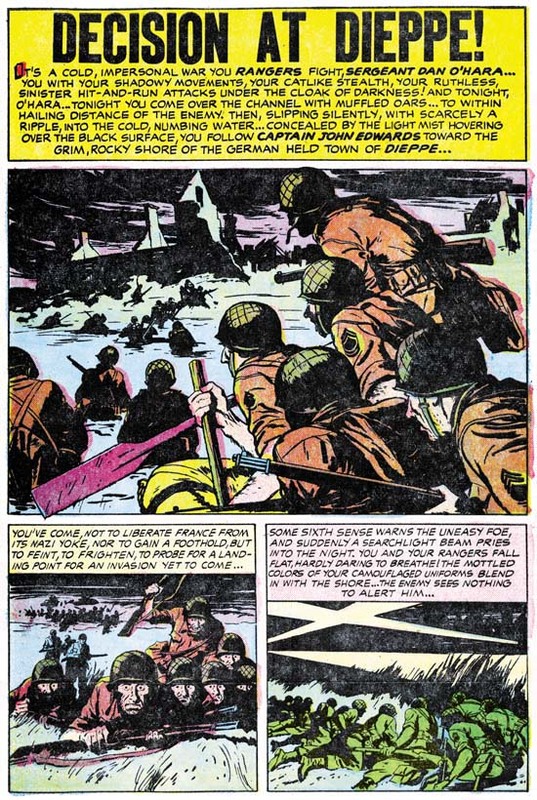 “Decision At Dieppe” is a good story but I feel that it suffers a little from the effects of the Comic Code. There is one scene where the American soldier is discovered by a German orderly. The text box tells us that the American attacks the German before any alarm can be sounded. Although the art shows the initial confrontation the next scene shows the American alone. We are never provided with anything from the actual fight. Only from reading the text is the story understandable. I am not suggesting that the Comic Code actually censored this part of the story, just that the writer or artist wanted to avoid any possible rejection. I really like some of the artists whose work appeared in Foxhole. Still it is nice to see some more stories by Jack Kirby. “Even Steven” is a tale about the vicissitudes of war as told from the viewpoint of a German soldier. In it an American soldier is captured by the German who later is captured by some Americans. The actions of each mirror that of the other. Yet despite the two characters performing essentially the same actions, the readers reaction to each is not the same. The American soldier embodies good while the German is inherently evil. “Kamakaze Joe” was another story from Foxhole that adopted an enemy as the lead character. “Kamakaze Joe” used that enemy’s narration to provide an explanation of his motivations. While we may not be willing to accept his culture we can understand why a Kamakaze pilot did what he did. 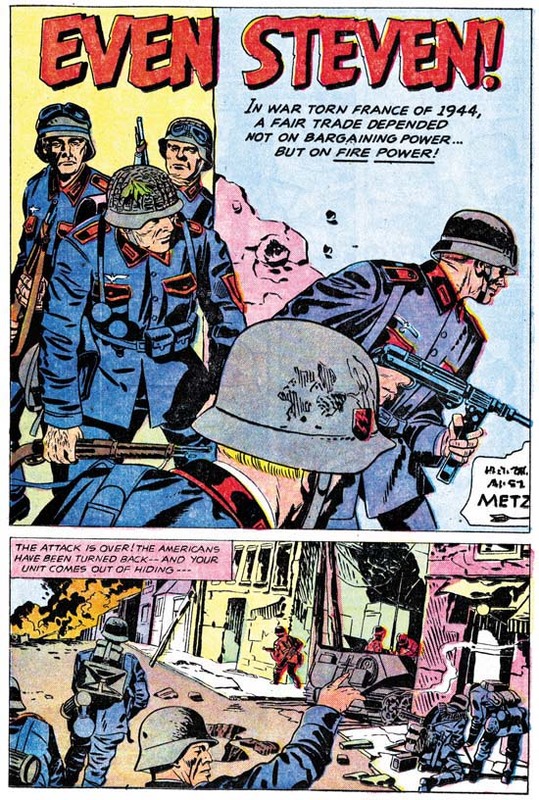 In “Even Steven” Kirby does not really attempt to provide any understanding of the German soldier. For Jack evil is a basic trait that does not need any explanation. This will be a one of Kirby’s recurring themes in the years to come. “Listen To The Boidie” provides an example of another of Jack’s interests, that of comic absurdities occurring during events that normally would be considered as rather serious. An American line is being faced with an assault from Koreans. We are told this tale by a former Broadway press agent. The Koreans have been relentless and our soldier owes his life to the efforts of a soldier from the south. This southerner happens to be a crack shot with a rifle but his mains interests seems to be bird whistles. He is constantly trying to have the main character give him an audition. You can trace Kirby’s interests from the start of his career to the end. They may evolve but they are generally present. However “Even Steven” and “Listen To The Boidie” seem especially characteristic of Jack Kirby’s later work. I do not think they would have been at all out of place had they been published in the title called The Losers that Kirby did in the mid ’70s. With “The 50th Man” Foxhole #6 steps out of the WWII or Korean war time period. Heck it even leaves wartime combat entirely. We now enter the gladiator arena during the Roman empire. This story man seem out of place in a comic with the title Foxhole but I say let us not quibble about that. What really is important is the story itself and “The 50th Man” is a great story. We find a gladiator about to undertake his fiftieth match. Win this one and he gets his freedom. He is a mountain of a man, strong and massive. But then why is he so concerned about his small and skinny opponent? This is our last chance to see Bill Draut do action, well at least for Simon and Kirby. 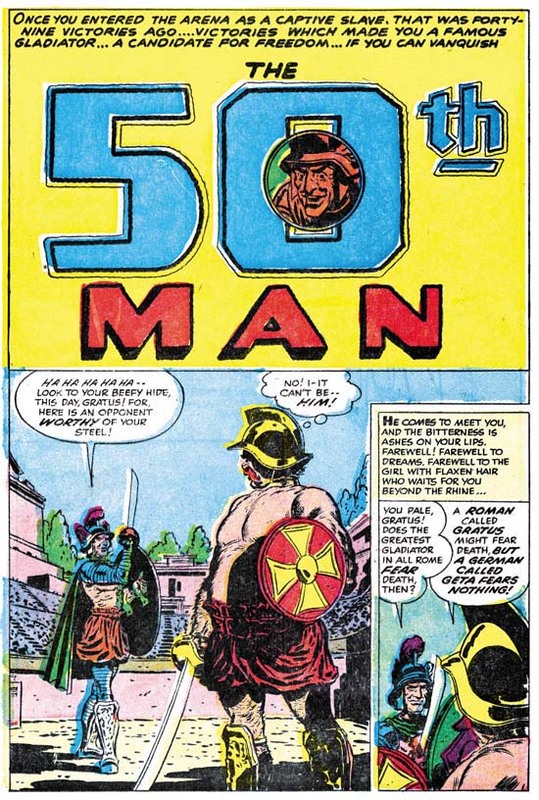 Once again in “The 50th Man” Bill’s action seems handled different then typical of Kirby, so I do not believe Draut is working from layouts. A WAC gets caught in the Battle of the Bulge. While there a letter manages to reach her. It is from her fiance and it is the female equivalent of a “Dear John”. Despondent she goes of to the battle line with a discarded gun hoping to end her pain. She does get shot but is only wounded. Eventually she is taken back to a hospital to recover. On the face of it this story might seem appropriate for Foxhole. It is after all not your typical war story. With six pages “Dear Joan” would seem to adhere to Foxhole formula of rather short stories. But page count does not tell all. Foxhole stories are general well crafted. It is hard to image how any part a Foxhole tale could be removed without it being severely diminished. They are like well polished gems. “Dear Joan” is not at all like that. Even with only six pages it seems to ramble. We learn from the letter the WAC receives about her romantic ties to a soldier. But then later we are given a flashback to how they met and feel in love. This flashback really seems superfluous. The handling of her attachment to a new soldier that happens in the end seems poorly done. The writing of “Dear Joan” just does not seem up to the Foxhole standard. The art is signed “Rocke”, which is a nickname used by Rocco Mastroserio. I do not believe Rocke did any previous work for Simon and Kirby but he did have a long history with Charlton. The artistic vision Rocke supplies is also very much at odds with the rest of Foxhole. Although part of the story takes place when the American forces were trapped during the Battle of the Bulge the soldiers all seem clean cut with their uniforms in good shape. Even the heroine seems to be well groomed and wearing makeup. This is WWII as viewed by Hollywood at the time. This is not the sort of war portrayed in the rest of Foxhole. 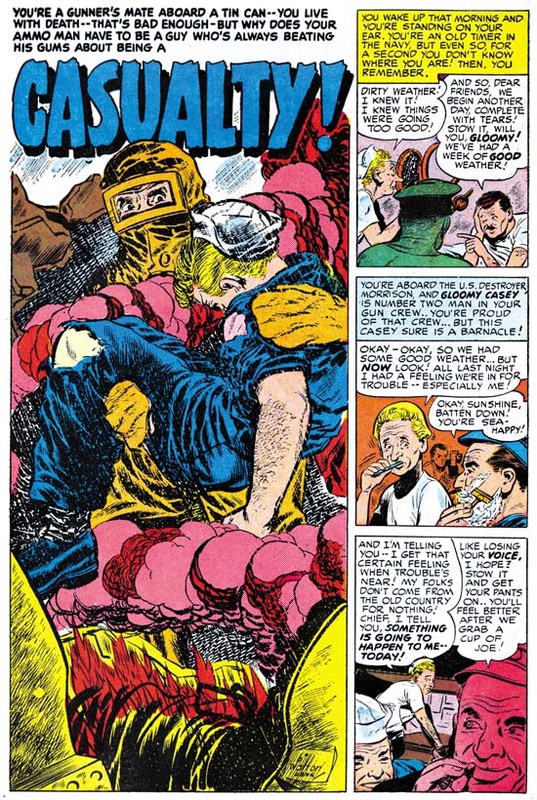 With Mastroserio’s long involvement with Charlton and because the writing is so unlike the rest of the Foxhole stories, I suspect Charlton supplied this story to augment the rest of the S&K material. 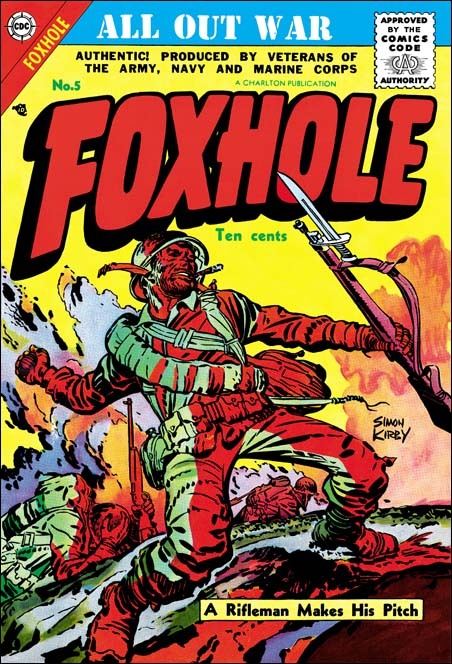 There was a seventh issue of Foxhole published by Charlton. None of the artists for issue #7 had ever worked for Simon and Kirby as far I have been able to determine. The stories themselves are no longer the unique type of tales that are found in the other Foxhole issues. Rather Foxhole #7 has now become a standard war comic and a rather boring one at that. I can only conclude that issue #7 was a purely Charlton production without any input from Simon and Kirby. I understand that for issue #8 Charlton changed the title of the comic and Foxhole was no more. This sort of thing was done to save on postal registration fees and was fairly common. Charlton did the same thing when S&K’s In Love title was changed to I Love You with issue #7 although in that case Kirby supplied the cover. 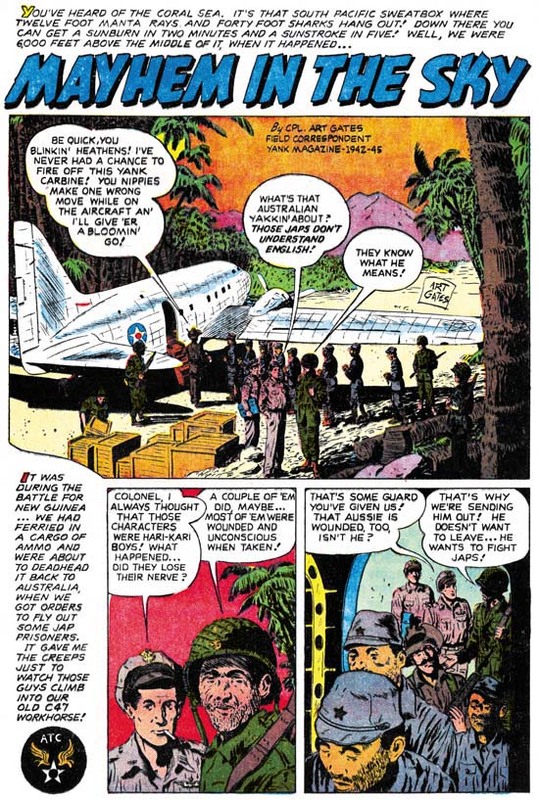 This is the Simon and Kirby Blog so it should not come as a surprise that I am a big fan of much of the comics that Simon and Kirby produced. That is not to say that everything they put together was of equivalent merit, some of it was better then others. If I were to pick what I felt to be the best S&K title it would be Foxhole. This makes it truly regrettable that this title is out of print (although not out of copyright). Even beat up copies of the original Foxhole comics have become rather pricy. This title begs to receive the same sort of republication that Boys’ Ranch and Fighting American have already received. But some of Foxhole have been reprinted. In Joe and Jim Simon’s “The Comic Book Makers” Joe describes selling some of the Mainline titles to Israel Waldman. 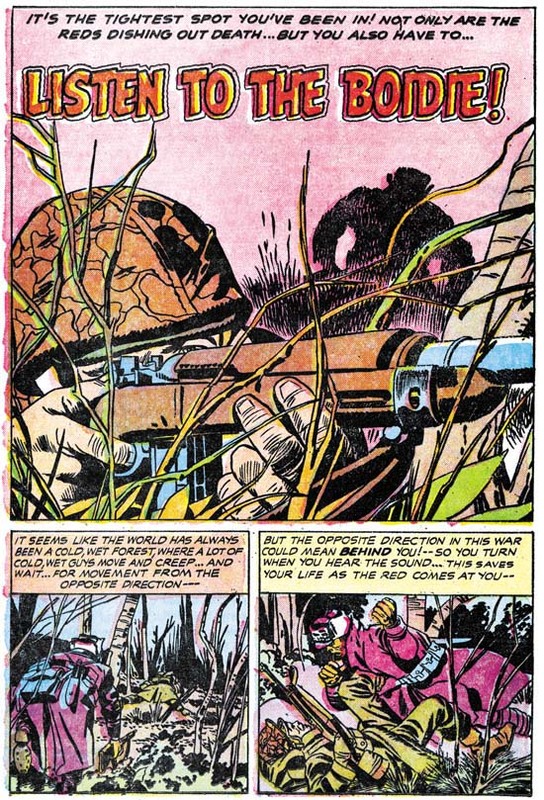 The Foxhole work was published by Super Comics in 1964. The contents of Foxhole #1 was reprinted in Super Comic’s Foxhole #11, Foxhole #2 as Foxhole #12 and Foxhole #3 as Foxhole #18. 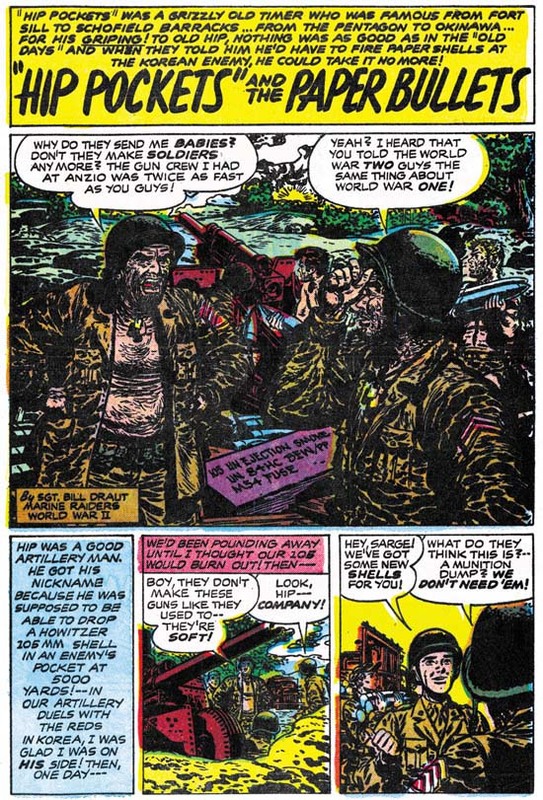 Super Comics also printed some other comics using the Foxhole title but they do not contain any stories from the original Simon and Kirby’s Foxhole. In keeping with Super Comics general policy, the covers to their Foxhole reprints did not use the original cover art. I have noticed that in the last few years the price of Super Comics have risen dramatically. However this is for high grade books. Low grade Super Comics still show up at comic conventions or eBay from time to time at reasonable prices. The covers may be beat up but who cares, they are not Kirby’s covers anyway! The bad news is that Super Comics are not common so you may have to be patient and diligent. Again none of the original Kirby cover art. I have not been keeping track of Battlefield Action in the marketplace. Still with a 1983 publication date I would suspect that lower grade copies would be reasonably priced. Reviewing all the Foxhole comics over a relatively short time has been very useful for me. It has allowed me to correct some early misattributions. By doing so I have come to see that Joe Albistur was even more important to Simon and Kirby productions then I had thought. For this short period of time Albistur is truly one of S&K’s usual suspects (along with Bill Draut, Mort Meskin and John Prentice). Joe Albistur’s Foxhole work has only increased my admiration for this fine but underrated artist. I have now reevaluated Bill Draut’s capabilities for drawing action. 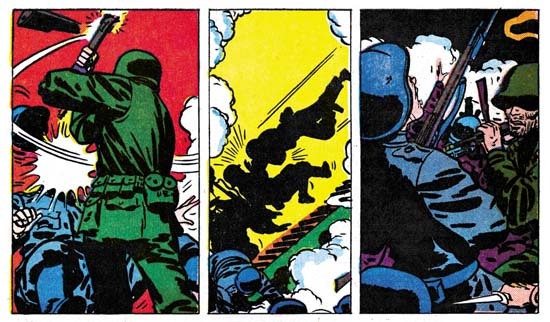 His early comic book work may have had some faults in this area, but he does some great action art in Foxhole. One thing that I have not mentioned yet is the absence of Mort Meskin in Foxhole. Actually Mort did little work for any of the Mainline titles although he was still drawing for Prize romance comics during this period. Mort seems to be the only one of the usual suspects who did not play a prominent part in the Mainline titles. I do not know why this should be but it seems worth investigating. Criticism of comic books by some of the public resulted in decreased sales. This was particularly felt by EC which published some of the more objectionable titles. In a domino affect, decrease EC sales lead to financial problems for their distributor Leading News which in turn created difficulties for Simon and Kirby’s new publishing company Mainline that used the same distributor. Eventually S&K had to shutdown Mainline and they then went to Charlton to publish their titles. 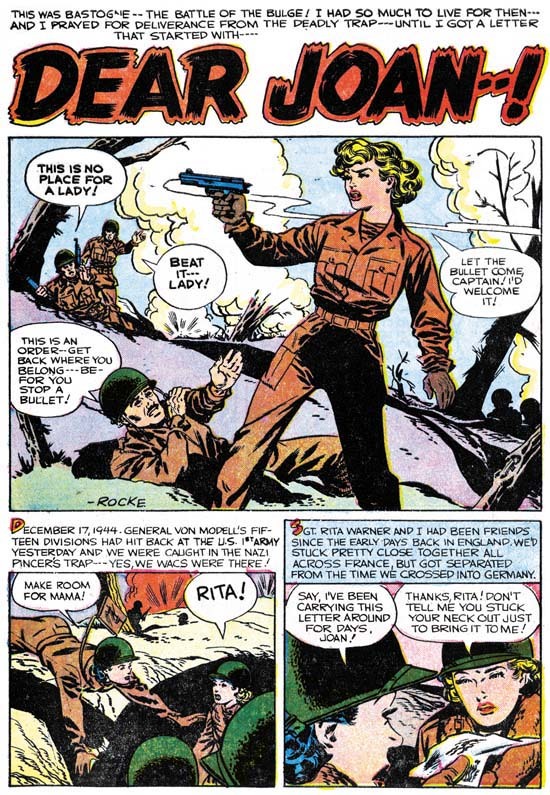 While the titles had been on a bimonthly schedule, the first Foxhole issue published by Charlton came out with an extra month delay. The whole change in publishers must have been somewhat unexpected because although this was Charlton’s first issue it had a postal declaration which still listed Mainline as the publisher. “Glide Into Glory” is about Arkie a wacky glider pilot. Are there any other kind? I see no reason to go into details about some of these Foxhole stories but that is not to say they are not good stories. We have seen Bob McCarty’s work before and here he continues to provide his quality art. The script is also entertaining. I guess the moral of the story is how important the independence streak of Americans was to winning the war. 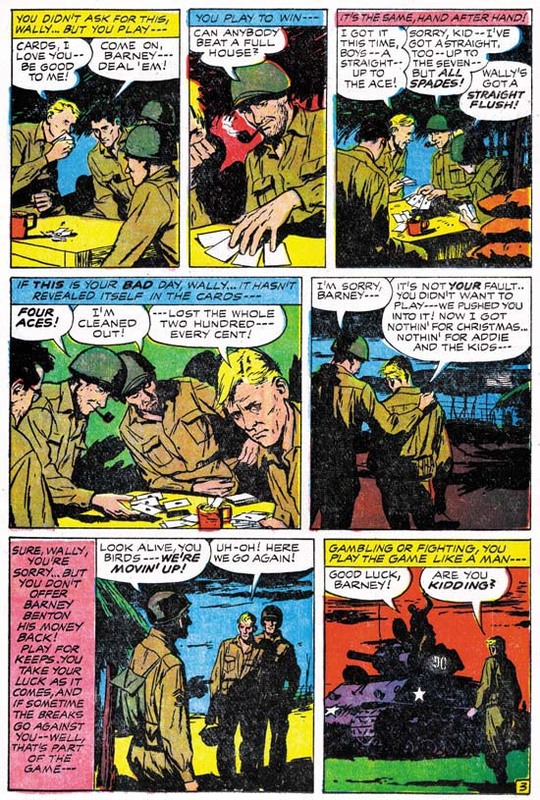 Another Kirby and Albistur team up in a story about Wally, a soldier who seems to have all the luck and Barney who wished he had. We previously saw Kirby provide a script that almost seemed appropriate for Black Magic. While “Lucky Stiff” is not so extreme it is still a rather off beat story. I will say that although I understand what Kirby was trying to do I do not feel the end was quite as successful as it should have been. Albistur for his part provides some rather nice art. I like the way he cuts off much of Barney’s face in the second panel of page 3 shown above. I think it is very effective in providing just of note of Barney’s frustration in a panel otherwise devoted to Wally’s calm good fortune. As I said this is our second example of Jack Kirby as a writer. We have also seen two stories that Jack drew (“Booby Trap” and “Hot Box“). Jack did seem to make writing changes to the stories he drew. 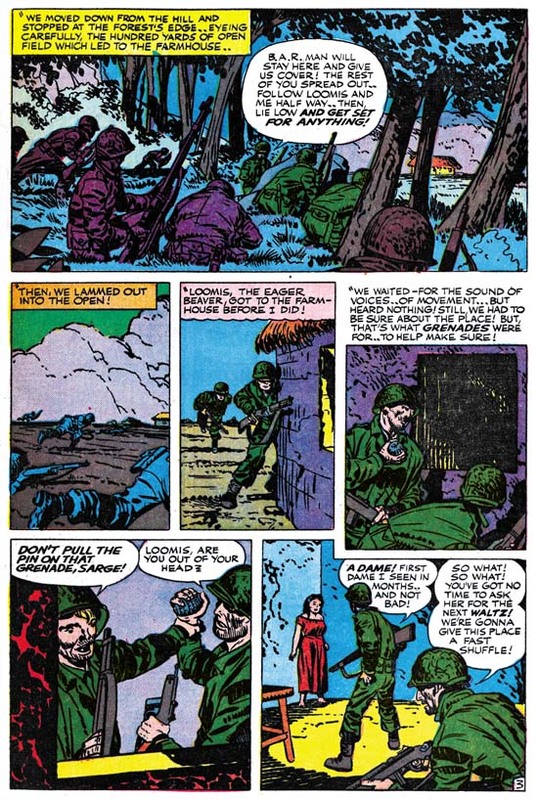 In both of these Foxhole stories drawn by Kirby there are small speeches that seem so typical of Jack. This sort of laconic retort shows up not only in other S&K productions drawn by Kirby but in work that Jack did late in his career. These Kirby-ish dialogs do not occur in S&K comics drawn by other artists. Now that does not particularly surprise me but I do find it unexpected that the two examples of Kirby as writer in Foxhole also lack these small Kirby speeches. While it is possible that Jack just did not feel they were appropriate for these stories, I suspect that it reflects on the type of artist Jack was. The scripts that Kirby provided Albistur are rather good but that was not the way Jack preferred to work. It is not so much that Jack was a visual artist as that it was hard for him to separate the writing portion of story telling from the drawing part. Jack’s scripts were more personal when the writing and drawing were done simultaneously. 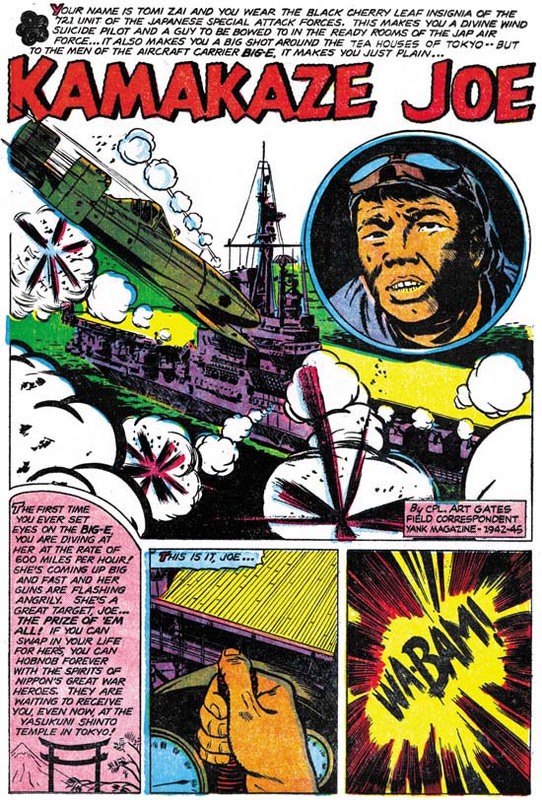 “Kamakaze Joe” starts with the main character flying his plane into the “Big-E” (the USS Enterprise, an aircraft carrier). This may seem to be more appropriate for near the end of a story, but it was a really effective choice by the writer. After this unusual start, we are taken back to trace the personal history of this Japanese pilot. Here Art Gates really shines. I am sure there was a lot of swiping done but Art has illustrated a story that really seems placed in Japan. The plot makes its way back to where it started and we are then given in the last panel an American perspective of what just happened. I really like “Kamakaze Joe”. Not only does it written from the enemy’s viewpoint but is probably the most realistic story of the entire Foxhole series. Art Gates also provides the art to a single page story called “Morale”. This is more the Art Gates that I am familiar from S&K romance comics. For them art seemed to specialize in single page pieces. Some gag pieces and other regular stories. But because the emphasis in Foxhole was the veteran status of the creators, S&K also made use of Gates for some longer stories as well. Bill Draut returns with another very short (three pages) story. I am sure that by now it is pretty obvious that I am very fond of the work by Bill, particularly as seen in Foxhole. I also feel he was a good at inking his own work, using a spotting technique with both similarities and differences from the S&K shop style. However Draut has taken his spotting too far in the splash panel in “Hip Pockets”. I understand what Bill is trying to do. What he wants is to give his soldiers a dirty and unkempt look. It actually works effectively in most of the rest of the story. For the splash panel he was too heavy handed in the spotting and the result is in all honesty a mess. Otherwise the story itself is a good one. A artillary man nick named “Hip Pockets” was from the old school, that is WW II. While fighting in Korea he is dismayed when he is ordered to fire propaganda leftlets into the enemy line. Posted February 25, 2007 in 2007/02, 6 Mainline, Alternate Takes, Foxhole, Periods, Topic, z Archive. Public criticism about the contents of comics had lead to the creation of the Comic Code. Although not a legal requirement, publishers knew that they must submit their work to this agency for approval or be rejected by most newsstands. Simon and Kirby’s company Mainline was no exception to this. So when along with their other titles Foxhole #4 was submitted for approval the Comic Code rejected the cover. Its depiction of a dead enemy sniper was too much for the delicate sensibilities of the young. In all honesty even without showing any direct signs of violence it is a very compelling but disturbing piece of art. S&K’s substitute cover had a close-ups of a face wear camouflage makeup. Simon and Kirby could still produce great covers within the Comic Code framework. The rejected cover for Foxhole #4 was based on an interior story “Find And Fire” by Bill Draut. It is unclear to me whether the cover developed from the story or the other way around. Often Simon and Kirby productions have this cover/story connection. Not infrequently each does not tell quite the same tale. Draut’s story starts with a splash very different from Jack’s original cover. Most of what we see is just the tree foliage. Only the sniper’s hand and firing rifle are visible. By doing so Bill has captured horror of having to cope with an unseen foe. The story itself is about a medical corpsman having to deal with a Japanese sniper alone. As a medic he is not supposed to fight and does not carry a gun. The Japanese, and the sniper in particular, did not care about such niceties and the American is forced to confront the sniper armed with only a knife. Its a great story illustrated by one of S&K’s top talents. 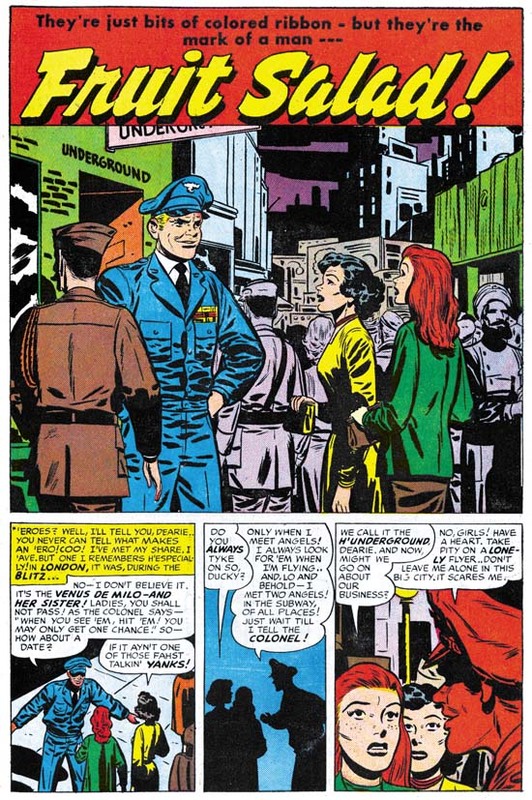 This time instead of Jack Kirby, Jack Oleck provided the script for the artist Joe Albistur. It is a great story about a professional soldier and the outfit he first trains and then fights with. The plot is not all that surprising but with it Albistur manages to present some great art. Look at that splash panel. Joe is marvelous at capturing people and their gestures but here he out does himself. There twelve individuals portrayed, each one uniquely. Only the face of two men are partially visible and yet Joe infuses them with personality. Elsewhere in the story there is a fight sequences with four panels without text. Previously we saw Bill Draut draw something similar. Could Oleck have written Draut’s story also and provided similar directions? Or could both artists have decided to do this themselves? However the decision was made it was an effective device to use in cases like this were the image was sufficient and words were not only superfulous but were actually detrimental. This is the second Foxhole piece credited to Jack Oleck. Two scripts are not much to work with in trying to understand Oleck’s writing style, but it is all we have. Actually that is not true. From Joe Simon’s collection I have part of another script by Oleck. That will be the subject of a future post. As I have said before I enjoy most of the stories in Foxhole. They are generally well written and the artists are very talented. I also get a kick out of “Mayhem In The Sky” but probably for reasons that were not originally intended. It is like watching a slasher movie where much of the fun is knowing that when someone goes out into the night to investigate a noise that he will be the next victim. This story is about an American plane that will be bringing some Japanese prisoner to Australia. The only guard will be wounded Australian soldier. Did I hear the background music become foreboding? When the plane reaches altitude it is placed on autopilot and the co-pilot takes a nap! At this point the background music is downright chilly. Needless to say it is not a stalker that is unleashed but a plane full of Japanese soldiers. Yeah it all seems a bit unbelievable but it is fun. Bob McCarty, a veteran of the Air Force, illustrates a submarine story. This is typical of Foxhole. Although written by veterans they are not autobiographical stories. Still the real service that the creators experienced does imbue Foxhole stories with special qualities. The men in the stories are not the clean cut heroes depicted in movies of that time. “It’s Mutual” is the earliest artwork for S&K by Ted Galindo that I am aware of. Hereafter Ted would often be employed by Simon and Kirby and, after the S&K studio breakup, by Joe Simon. Generally Simon and Kirby used the more talented artists of their day. Unfortunately I feel Galindo is an exception, I would call his work adequate at best. Posted February 18, 2007 in 2007/02, 6 Mainline, Foxhole, Periods, z Archive. The artist for “The Face” is Joe Albistur who does marvelous work. Earlier I had misattributed this story art to John Prentice. To be honest at that time I did not look carefully at the story and relied on an old attribution from my database. When I scanned and restored the story it was just so obvious that Albistur, not Prentice, was the artist. Albistur’s men are often quite varied and he is good at capturing traits and gestures. Men by Prentice often follow a more restricted mold with long faces and small eyes. At times Joe would do a man’s face in a manner similar to John. Even so Joe’s work can usually be distinguished by their more rough appearance while John’s are done in a smoother manner. When it comes to women the two artists are worlds apart. Prentice’s women have a sophisticated beauty while Albistur’s are more earthy. A nurse in “The Face” is a clear giveaway that the artist is Albistur. Joe only worked for Simon and Kirby for about a year, with cover dates from September 1954 to October 1955. During that time Albistur shows up often and for that limited period he can be considered one of the usual suspects for S&K productions. 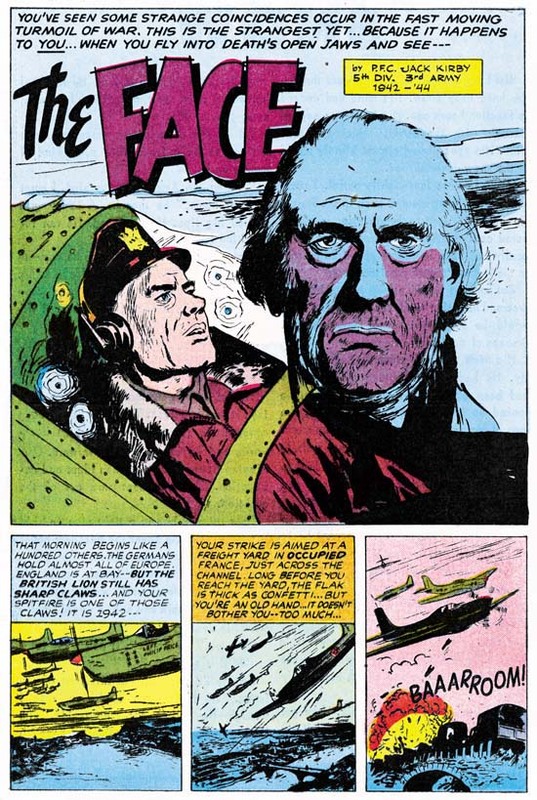 Although Albistur is a fine artist what makes “The Face” a special treat is that Jack Kirby is credited. Since the art was obviously not done by Jack that means he must have been the writer. I do not have any doubts that Jack contributed to the writing of many Simon and Kirby productions. We know however that S&K employed writers. My understanding is generally Jack and Joe Simon would verbally provide an outline of a plot to their writers. Then when the script came back S&K might then make whatever alterations they saw fit. The suggestion for “The Face” is that Jack did a more complete approach to the writing. Joe Albistur was from Argentina and did not serve in the U.S. army. So to keep with the basic premise behind Foxhole the writer would have to be someone with military service. Certainly Jack filled that requirement. But I am not sure why someone like Jack Oleck was not used since he also was a veteran. The Kirby & Albistur combination would be used again in another issue of Foxhole. 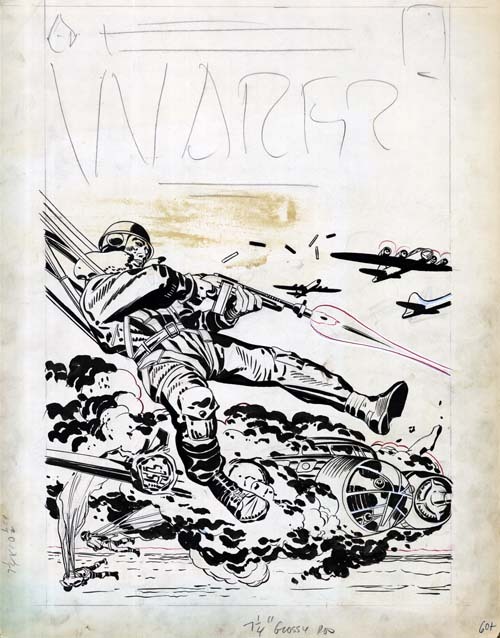 Jack Kirby’s art output had dropped during the period that the Mainline comics were being produced. I cannot help but wonder if one of the reasons for this more limited Kirby art production was due to his doing more writing. Unfortunately credits were not given in the other S&K titles so it is hard to be sure. Our narrator flies a Spitfire as part of a British air force strike on Nazi occupied France. During a dogfight our hero gets badly wounded by enemy gunfire. With great difficulty he manages to fly his plane back to home base but makes a crash landing. Up to this point this is very much a war story, now it seems to turn into something from Black Magic. While our hero believes himself to be dying and familiar face appears to him. It is not the face of someone close to him but it is familiar nonetheless. We are taken back to before the war when our narrator was visiting Vienna where he met the man. This individual was trying to escape from the Gestapo who were after him because of his religion. The comic does not say, but obviously he is Jewish. Our hero helps the man escape to Switzerland but never managed to find out either his name or profession. Now the story returns to wartime and our injured airman comes to a finds out what the importance of the man whose face he has seen. It is easy to imagine that this is a Kirby plot. Although a war story it has the sort of plot twist that is common in S&K productions like Black Magic. There is nothing in the writing that suggest that this was not done by Kirby or that anyone else played a significant part in creating the script. On the other hand missing from the script are any of the typical Kirby laconic speeches. I have remarked previously about these. They are frequently delivered as a retort to someone else, have an odd sort of off topic quality, and are a little over the top. 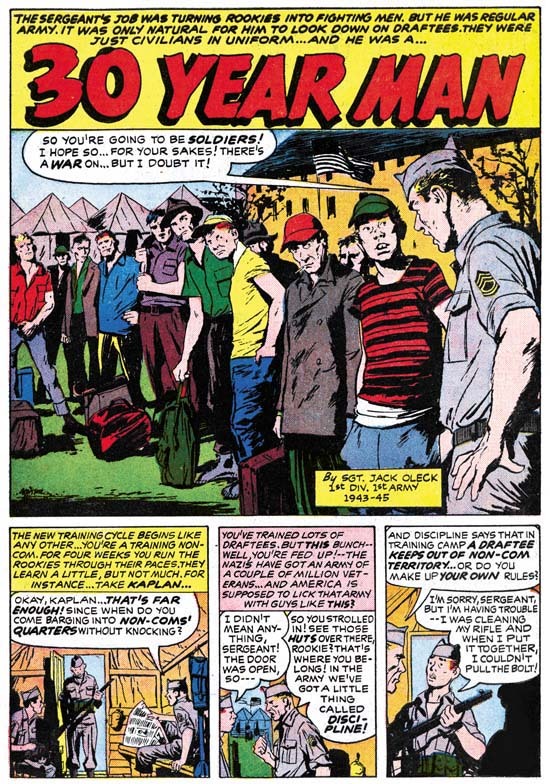 These short speeches often are found in Kirby drawn S&K pieces and re-occur late in his career when he once again was able to achieve more control over his work. I leave further discussion of this subject off until later when I review another Kirby/Albistur story from Foxhole. I previously discussed the background story of “Office Upstairs”. It concerns the Death March and the Japanese POW camp in the Philippines. The story itself is narrated by a soldier and begins shortly after Pearl Harbor. The Americans and Bataan are unprepared for the Japanese assault. The soldier also blames the softness of his fellow Americans. In particular the evident softness of the non-combatant who serves as the medical officer. It is only after the Death March and the struggles in the prison camp that the soldier changes his mind about that medical officer. I have to admit there are parts of this story that are rather corny. Still I find it incredibly moving. As usual Bob McCarty does a excellent job on the art. This is one of the few S&K productions we can say who the writer was. Jack Oleck may have been Joe Simon’s brother-in-law but this story shows he was an accomplished comic book writer. Although Joe has indicated that Jack did a lot of writing for S&K we rarely can say which stories were his. In a future post I will discuss another Foxhole story that is credited to Oleck. At some time I will also write about a story not from Foxhole that Jack Oleck wrote. Foxhole #3 had a new development, S&K started to provide a credit box. It really appears that even before this S&K would encourage their artists to sign their work. Well at least artist signatures were not unusual in Simon and Kirby productions. Credit boxes were something else and these appear in no other Simon and Kirby comics. Actually credits were rather unusual in the industry before the Silver Age of comics. There were some special exceptions such as Bob Kane for Batman (of course his credits was for work that was mostly ghosted by other artists). Even Simon and Kirby often got credits when working for Timely or DC. But these were special cases. Bob Kane’s credit was part of the deal he made with DC when he created Batman. While Simon and Kirby’s comics were so successful that their name alone could help sell a comic. Most artists at that time would never get such credit. The credits now provided in Foxhole were not present to highlight the artist. In fact the credit box does not identify what the cited individual did. In some cases he was the artist, in others the writer. You cannot tell this from the credit box. The information the credit box does supply is what military service the individual had performed. The premise behind Foxhole was that the creators were actual veterans and these credits were used to show that this was actually true. Even so these Foxhole credits provide a window into contributors to Simon and Kirby productions that we may not otherwise have. As far as I know the artist Bob McCarty never signed any of his work for S&K. The credits in Foxhole was the only method I had to help identify his work. We know some of the writers that work for Simon and Kirby but generally we have no idea who did what. But Foxhole provides some stories written by one of them, Jack Oleck. Even more surprising we have some stories written (but not drawn) by Jack Kirby. You might think you know what to expect from a story with a title like “Chicken” in a war comic book. You would expect a story about bravery and overcoming fear during battle. But this is Foxhole and what you get is something else entirely. Instead we meet Mac, a soldier who has been fighting the Nazis for eighteen days and now finds himself close to Paris. His daydreams of a visit to that city seemed destroyed when he is told that they will not be going to Paris because they are going to let the French underground take it. A chance encounter with a guy in a jeep named Freddy leads Mac to go to Paris despite orders. Freddy tells Mac to ditch his stripes because it will be safer if M.P.s show up. Well Mac and Freddy have a great time in Paris; beer, girls, dancing, the works. That is until the M.P.s show up. But Mack and Freddy are not about to be taken in. They split up and Mac makes it back to his company. There he finds that he is about to go on another campaign. As he prepares Mac sees Freddy only to be surprised at who Freddy really is and we learn what the meaning of the title was. I like Bob McCarty. He may not have a style as distinct as Draut, Meskin or Prentice but he draws a good story. He does not seem strong in artistic effects like the use of chiaroscuro but knows how to adjust his panel compositions so as to keep the story interesting. His lines are clean and sensitive with a flair and not dry. Simon and Kirby generally used good talent and Bob McCarty is no exception. The credits tell us that Bob served in the U.S. Air Force. The Air Force was part of the Army and not a separate branch of the military during the war. This is a story of Joey a young man who desires to revenge the death of his brother who was killed in Korea. Joey switches places with Sam who recently got his draft notice. Joey becomes a good soldier, so good in fact that he becomes a hero. Unfortunately for Sam this leads to deception being discovered. The credits tells us that Art Gates was a Field Correspondent for Yank Magazine. 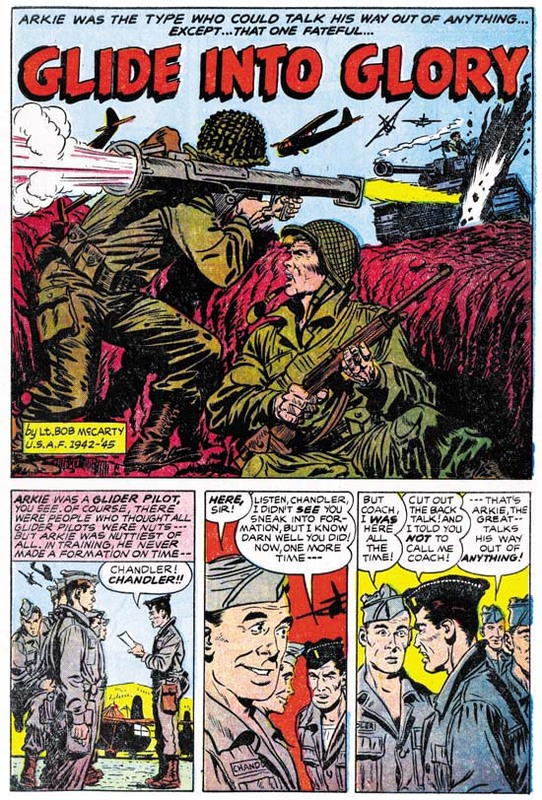 Yank Magazine’s motto was “written by the men… for the men in the service” Art is a bit of a surprise to me. His forte really seems to be gags comics. Yet he also is able, as “Listen To Me, Sam” shows, to draw standard comic book stories. I do not think there were many artists who like Art did both. Art also did some “realistic” pieces for some of Simon and Kirby’s romance comics but those were all very short, generally single page works. The Commies cut a communication line and later kill the man sent to repair it. They then use the dead soldier’s walkie-talkie to contact the Americans pretending to be the soldier. The fake soldier reports that he is lost and will use the signal strength as a means of finding his way back to headquarters. Of course what the Commies are really doing is using this as a means of locating the American headquarters so that they can attack it. 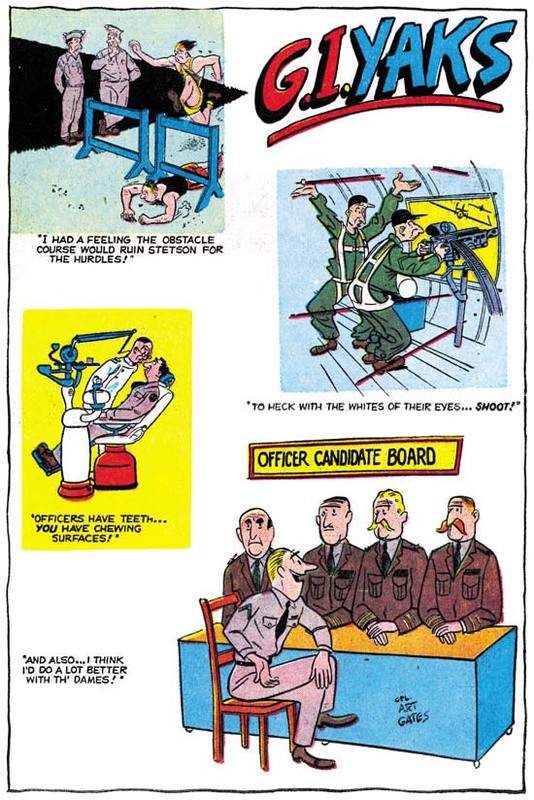 Like he did in “The Replacement”, here Bill Draut uses an bird’s eye view at the start of the action before zooming in. I find this a very un-Kirby way of telling the story so I am convinced once again that Bill is not working from Kirby layouts. Another nicely done effort by Draut, particularly considering that the story is only three pages long. Jack Kirby only provided the covers for most issues of Foxhole. However for Foxhole #2 Jack penciled two of the stories. I previously discussed “Booby Trap”. The second Kirby contribution is “Hot Box” a real gem despite its short length of only two pages. What a splash panel! Despite it being a close-up, because of the head gear all you can see of the man are his eyes. Only part of the gun that he is firing is visible and we cannot see his target. 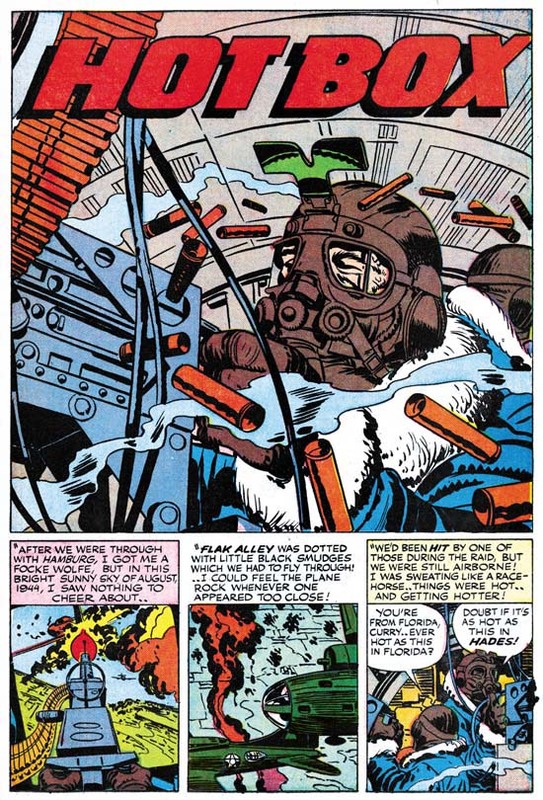 But with the low angle viewpoint, the empty cartridges flying about and the effective use of perspective this is one of Kirby’s most exciting splashes. Jack keeps this sort of visual impact in each of the panels that follow. Only two pages, but Kirby makes the most of them. The story itself is rather simple. We are told that the plane was hit by flak during a raid. The aircraft was still flying but a fire had developed. The crew was trying to make it back but the effects from the fire was growing, hence the title for the story. Jack provides a dramatic end, it is almost another splash panel. 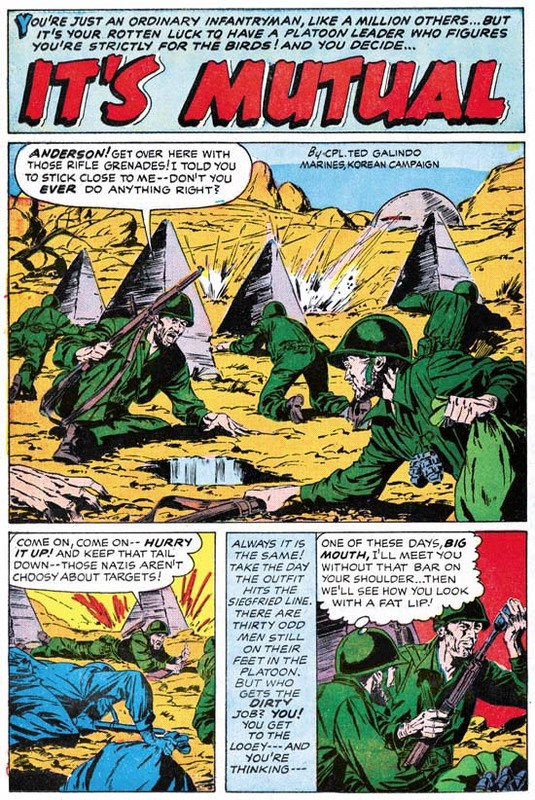 Jack Kirby did not draw many stories for Foxhole. Those that he did provide are just so incredible. I suspect that many artists would not give their best effort for such a short story as “Hot Box”. Jack on the other hand seemed to take this shortness as a challenge. He wanted to provide the all excitement of a fuller length story. I believe he was completely successful and that “Hot Box” was the best piece from Foxhole. “Dishonorable Discharge” seems a little out of place in Foxhole. For one thing most Foxhole stories are three to six pages long. If we discount Foxhole #7 (which was not a Simon and Kirby production) only “Dishonorable Discharge” is longer having ten pages. I do not know who the artist was but I do not think he did anything else for Foxhole or the other Mainline titles. Further the story itself seem more appropriate for a crime magazine then a war one. The story takes place in ’36 and ’37 well before the U.S. entered the war. At the start we find Socker Bates doing deep sea diving for the navy. Socker wants to show a girl a good night on the town and he does, spending money like there was no tomorrow. Unfortunately it turns out he stole it from the navy paymaster. Socker is apprehended, sentenced to serve a year in prison and then given a dishonorable discharge. With his bad discharge, Socker has trouble finding work. Eventually he teams up with a down and out character who has a diving suit. Together they do salvage operations. A girl comes between them and Socker finds out that his partner is planning to run off with the girl and the money. That is until Socker Bates decides to take revenge. Like I said it sounds more like crime genre then war. It is not even appropriate for Police Trap, Mainline’s crime comic. Police Trap focuses on the police angle not the criminal but the police are nowhere to be seen in “Dishonorable Discharge”. This story is so out of place for Mainline that I really do not believe that S&K had it made. Rather I suspect that S&K picked it up, probable at a bargain price, from some failed comic book line. Or perhaps from the artist when the story was rejected by its intended publisher. S&K did something similar when they bought some romance work from the failed publishing company of Ross Andru and Mike Esposito. That romance work ended up in some of the Prize romance comics that S&K were producing at this same time. 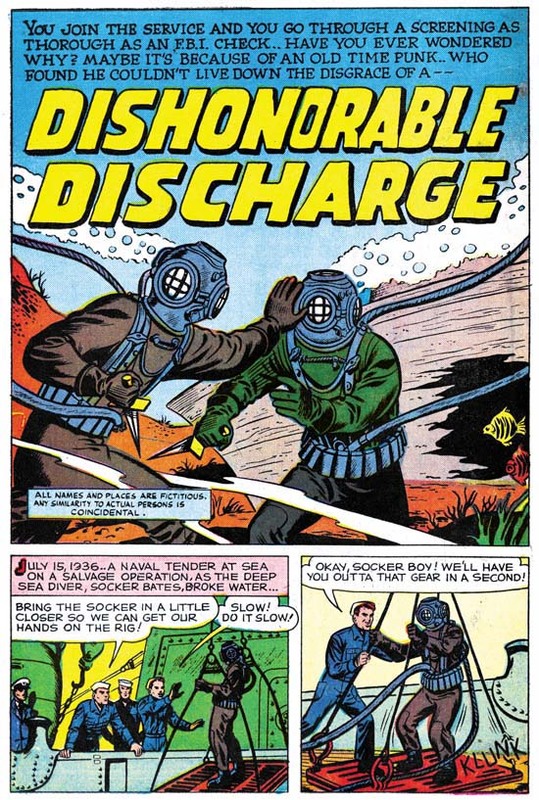 In any case “Dishonorable Discharge” is one the poorer efforts from the entire Foxhile comics. Posted February 10, 2007 in 2007/02, 6 Mainline, Foxhole, Periods, z Archive. Most Foxhole stories are very short yet they have no feeling of being rushed. Jack Kirby’s story, “Booby Trap” is only six pages long but look at page 3 where he spends four panels on the approach of a Korean farmhouse. What a masterpiece this page is. The distant view of the farmhouse with the troops safely concealed by trees. The silent but exposed crossing of the field. The arrival at the farmhouse and the preparation for the use of a grenade. Ending with a sudden reprieve and the revelation about the presence of a female civilian. Kirby is renown for his handling of action but on this page he shows he can also be the master of suspense. He does it so well that it is a side of Kirby that you wished he did more often. As for real action there is plenty of that to follow. But for Jack action is up close and personal. His soldiers are real warriors who fight with knives or hand-to-hand. Even when a rifle is fired it is not from a distance but so close that there will be no second try if the first does not hit its mark. We had to be sure about the place! But, that’s what grenades were for… to help make sure! This is the equivalent of shoot first and ask questions later. A dame! First dame I seen in months.. and not bad! So what! So what! You’ve got no time to ask her for the next waltz! We’re gonna give this place a fast shuffle! Before leaving my discussion about “Booby Trap” perhaps I should point out that the B.A.R. referred to in the first panel of page 3 is short for Browning Automatic Rifle. The B.A.R. man is shown in that panel as the one on the left in the foreground. In the story this acronym is used without any explanation. They just assumed that the reader would be familiar with the term. Although the B.A.R. man would show up again in the story and we will get a better view of his rifle, we will never get to see him fire it. From the same issue there is a story by Bill Draut that makes a good comparison piece to Kirby’s “Booby Trap”. “Replacement” is an even shorter work being only four pages long. In a previous discussion about Bill Draut I had commented that I thought Bill was a little uncomfortable with drawing action. I had come to that conclusion because in his early work Draut really did seem to have a little problem with things such as fight scenes. Most of the work that Bill did later was for romance comics and would not require action. But as this story shows (and at least one other in Police Trap) I was incorrect. Actually it should have been obvious that Bill would know how to handle action scenes, after all he served as a combat artist for the Marines during the war. His early shortcomings in this area probably was due to his then-inexperience in comic book art. I am sure there will be those who say that the reason that Draut handled the fight scenes in this story so well was due to having worked from Kirby layouts. But I do not at all believe that to be the case. Kirby likes to handle fighting “up close and personal”. Even the advance on the farmhouse that is imaged at the start of the post is done as if the viewer was actually a part of the operation. Bill on the other hand gives a bird eye view of the fight before he zooms into the thick of things. To me these are two very different ways of telling the stories. 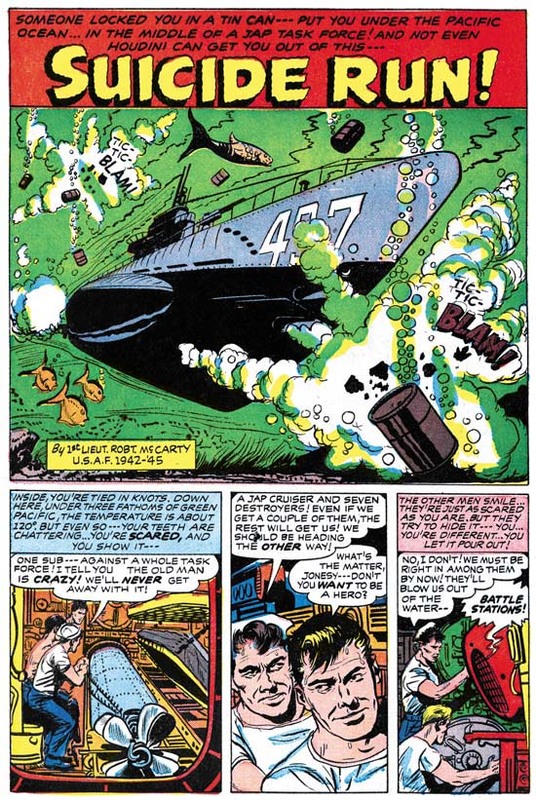 In “Replacement” The fight does becomes hand-to-hand on the next page, but even there Draut’s technique seems very different then that used by Kirby. Everything indicates to me that this story was not done using Kirby layouts. As for the writing, I do not find any of those “pure Kirby-isms” like I see in “Booby Trap” and so many other S&K stories drawn by Jack. I still believe that Jack and Joe were involved in the providing plots to their writers. That would explain why, despite all the different artists that worked for Simon and Kirby, their productions have their own unique flavor. But when the script returned from the writers, Kirby was more apt to re-write material he was going to pencil then he was for stories to be drawn by other artists. There is something special about the fight scene presented by Bill. Notice that the last four panels have no text, and this actually extends to the first three panels of the next page. Such a sequence of panels without text was quite unusual at the time, I cannot thing of another S&K production that has one. Years later Jim Steranko would cause a bit of a stir when he did something similar over two pages. After Steranko this technique has become more common. My purpose in comparing Bill Draut’s story with the Jack Kirby piece is to show differences in approach. It is not a rating of one artist over another. Such a comparison really would be unfair to Draut. After all there really are not many artist in the same league as Kirby. Actually the only one I consider an equal to Jack is Will Eisner. But I feel that stories such as “Replacement” show how really fine an artist Bill Draut was. Other then the cover, there is no Kirby art in Foxhole #1. Actually Jack’s output seems to have decreased during the time that Simon and Kirby launched Mainline, their own publishing company. Joe Simon has generally been considered the businessman in their partnership. However I believe the best explanation for Kirby’s decreased page count during this period is that he was also involved in the business end of running Mainline. Joe Albistur only worked for S&K during this period when the Mainline/Charlton titles were being done. He shows up in those titles and in the Prize romances and seems to have taken up the slack from Jack Kirby whose artistic contributions were at a low during this period. “Eight Ball Hero” is a story of a soldier about to get a medal. While waiting for the presentation event, an army newspaper reporter asks around about the hero. It seems that everyone he talks to expresses surprise. In their opinion the only thing the hero was good for was griping about the army. As the reporter asks around he gets the story of what the soldier did to deserve the medal. No question about it the soldier was a hero. However his motivation was not what would be expected of a hero. John Prentice is one of a trio that I refer to as the usual suspects. I gave them that name because they played such a prominent part in Simon and Kirby productions. Most of what John did for S&K was romance work so it is nice to seem him in a action story. Not that I have not seen it before. I previously posted about his contribution to Bullseye. Although Nick Caputo has pointed out there seems to be some Kirby involvement. I particularly suspect Jack may have been involved in doing layouts for Prentice’s Bullseye work. Another example of Prentice doing action was the cover for Young Love #55. In this case I do not believe John was working from Kirby layouts. The actions scenes for “Eight Ball Hero” do not seem as well done as those by say Bill Draut. Although on a whole Prentice does an excellent job of telling the story. John has a real smooth realistic style and he really captures the hero’s attitude. John was already in the service at the start of the war. He stationed at Pearl Harbor when it was attacked by Japan. When starting to read “Fruit Salad” one might get the idea that the story would have been better placed in Young Romance. This might especially seem appropriate because the artist is Bill Draut who did so much romance work for S&K. The story is about an American air force man who picks up two English ladies and takes them for a night spent with a friend. The story is told by one of the ladies who becomes unhappy when she becomes paired up with the friend. She finds the one they first met as courageous and fun while she judges her partner for the evening as rather morose. Like I said it sure sounds like a romance. But then an air raid reveals the true nature of the relationship between the two air force men and the lady’s opinion about the one she was paired with is changed. This is a great example of why I find the Foxhole so interesting. It is a war story told not during a battle but while on R&R. It is about the affects of the war on those who serve and what courage really means. One other story from Foxhole #1 is “Casualty” by Bill Walton. The story is about a navy man who whines all the time and on the day covered by the story is convinced that something dreadful will happen to him. His ship is attacked and in the ensuing battle the group the seaman belongs to gets hit. But rescue comes and we later learn the fate of our man. I have to say this is not one of my favorite stories from Foxhole. The art by Bill is okay but he is not one of the better artists from the title. The story tries to provide interest and a surprise ending but does not really deliver. I do not want to make it sound that “Casualty” is bad, it just not as good as most stories from Foxhole. But even in this story you can tell an attempt has been made not to provide a run of the mill war story. “Casualty” is the only story in Foxhole that was signed by the artist. It was signed as “Bill Walton, USNR”. Posted February 4, 2007 in 2007/02, 6 Mainline, Featured Work, Foxhole, Periods, Topic, z Archive. I guess you can expect that some of my posts in the near future will be based on Foxhole. I am currently restoring the contents of this Mainline and then Charlton title. As I do so I am reminded just how great these comics are. 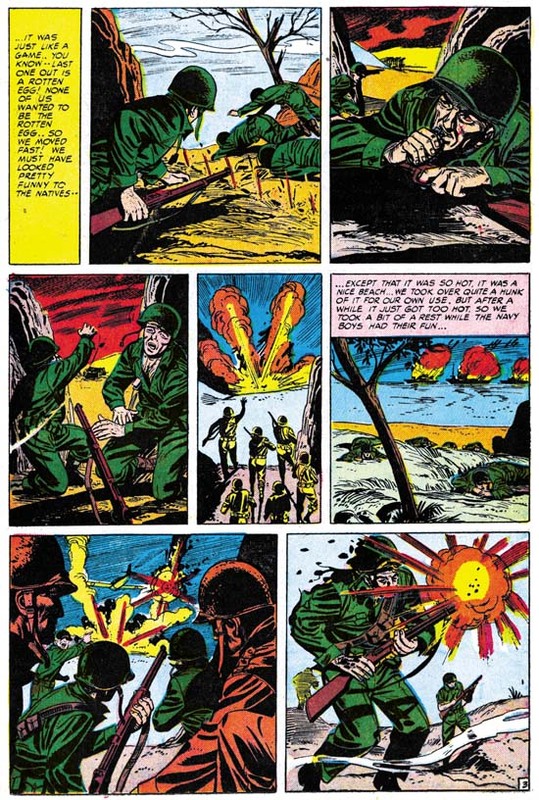 Like I said in a recent comment, I believe that Foxhole is a sadly neglected Simon and Kirby masterpiece. The original comics have become rather pricey and the Super Comics reprints are not that easy to find. It would seem that Foxhole really deserves to be collected together in a reprint volume. Their only drawback is that there is not a lot of Kirby art in them, although what is there is quite good. However the other artists that work for S&K are at their best. The premise behind Foxhole was that the stories were told by men who had actually served during a war. This does not mean that the stories were realistic, this was the ’50s after all. What you do get are features that are not your typical war stories. You might think when starting to read a story that it was something more appropriate for Black Magic or Young Romance. Then the story will take an unexpected turn and you realize that it really does belong in Foxhole. Most stories are rather short, usually five to seven pages long. But despite their brevity the stories still do not seem rushed. Kirby drew one story that had only two pages and it was still great. 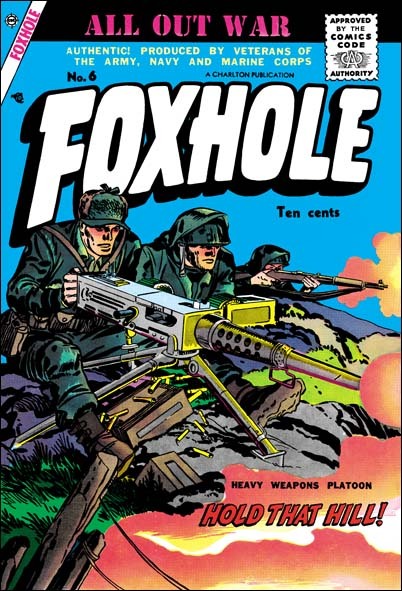 The Foxhole covers were all done by Jack Kirby (but these were not used for the Super Comic reprints). Well that is except for Foxhole #7 which frankly does not seem to have anything to do with Simon and Kirby as none of the included artists worked for them. As I have previously discussed, I find these Foxhole covers just incredible pieces of comic book art, some of Jack’s best work. 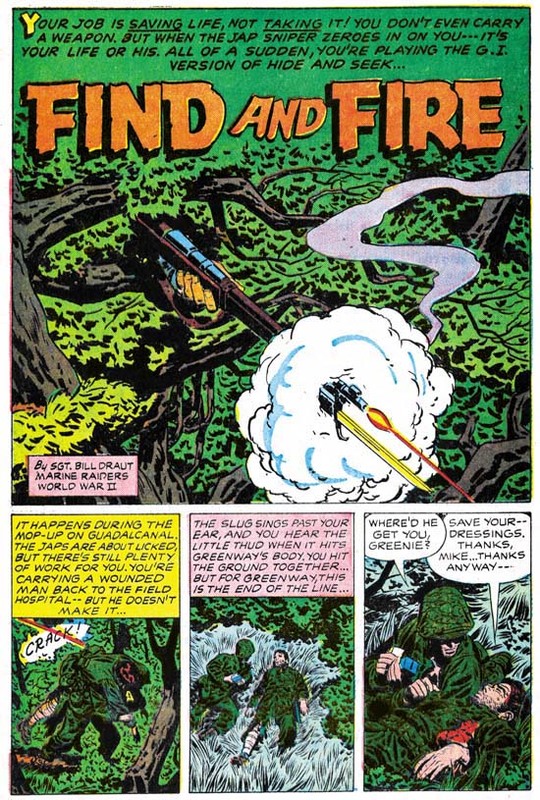 That is except for the Foxhole #6 which is one of those rare examples of a boring Jack Kirby cover. 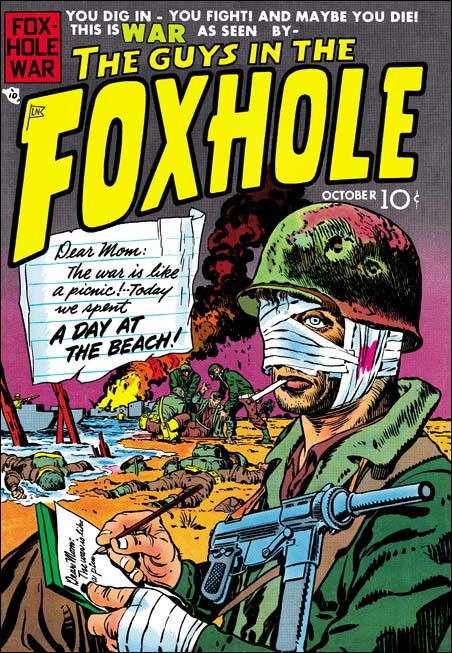 The cover for Foxhole #1 is not quite like the other Kirby masterpieces Foxhole #2, #3, #4, or #5. This is largely because it has been shown, by I believe Tom Morehouse, to be a swipe from a painting. But you can understand why S&K choose this painting to copy from, it certainly is a striking image. The wounded soldier writing a letter on a beach with medics aiding a casualty in the background along with some other warriors lying face down beyond the need of any medical attention. It is fortunate that the Comic Code had not yet begun, because I am sure this cover would not have passed their censure. 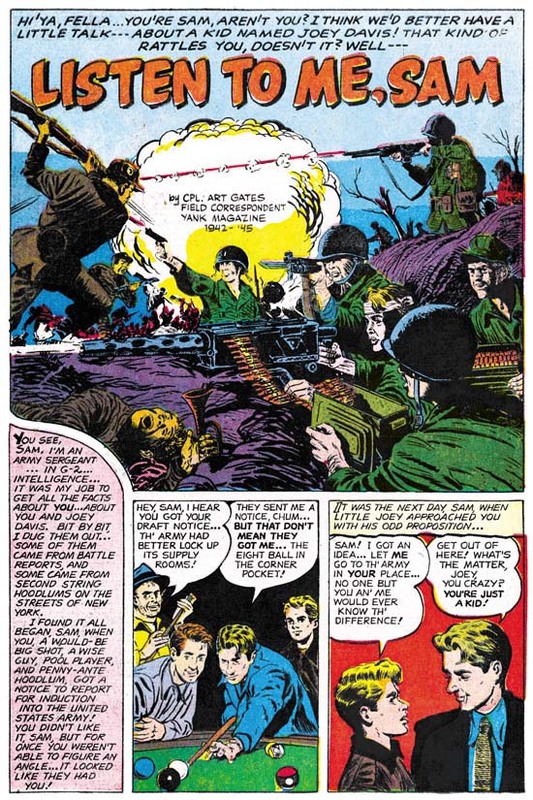 Despite the adverse publicity some of their comics received after the publication of “The Seduction of the Innocents”, Simon and Kirby generally did not have problems with the Comic Code. 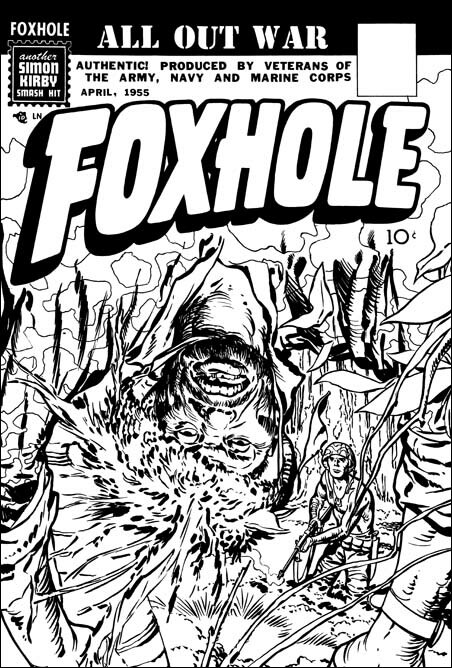 But there was one the original cover for Foxhole #4 featuring a dead soldier hanging upside down from a tree that the Comic Code rejected and was never published. I have not had the time to find the original article showing the source that this cover was swiped from (I do so need an index for the Jack Kirby Collector). It would be interesting to see if that source somehow provided the theme “A Day at the Beach”. That was the title used for the story that the cover was based on. Or was it the story that was based on the cover? In any case the story was drawn by another artist. I am not sure who the artist was but I wish S&K had picked someone better. It is not that the artist was bad it is just that most of the artists used in this title were so much better and the story really deserves a superior artist. It has often been said that Kirby did layouts for the artists that worked for the S&K shop. I do not completely deny this as a possibility. On the other hand I do think it is necessary to make comparisons between a particular piece and contemporary work drawn by Kirby. Had Jack done a layout you would expect to see similar visual techniques used in telling the story. 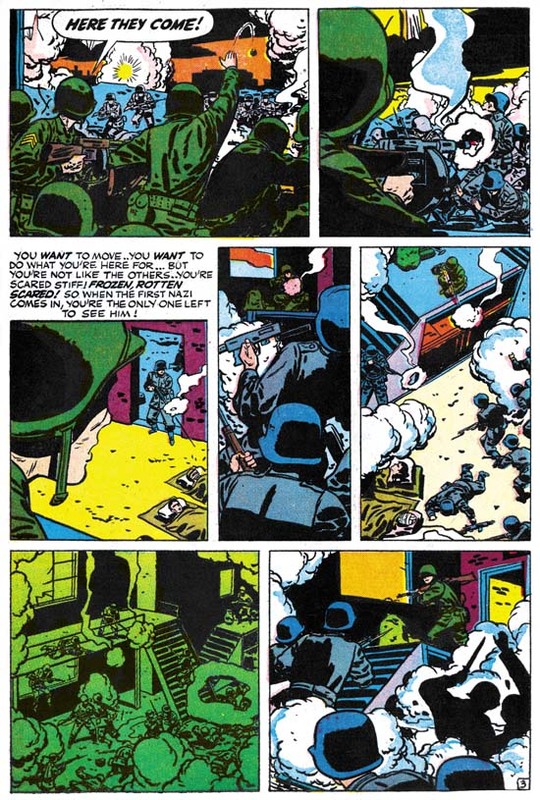 An artist might swipe a particular figure or even a panel from Kirby, but any similarity to Jack’s work that stretches over a number of panels is more likely to be due to the use of layouts. 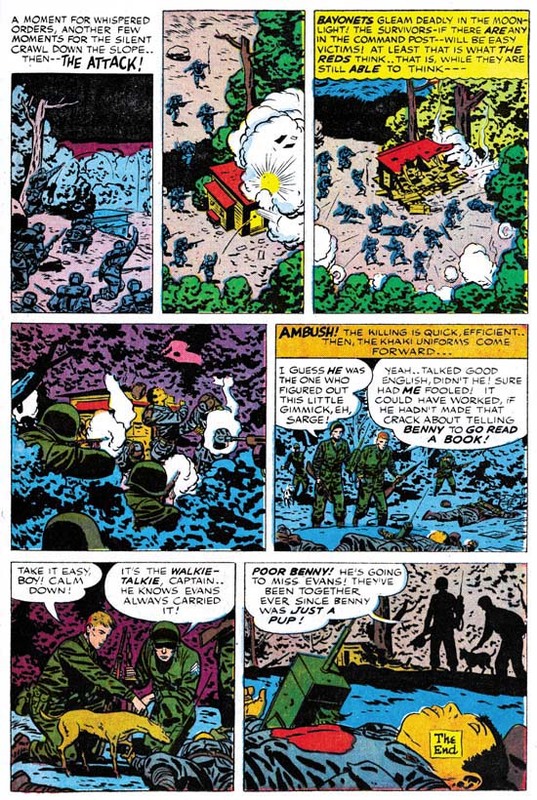 I have been making these comparisons as I restore the Foxhole comics and so far I have found nothing that suggests that Foxhole stories were done by artists working from Kirby layouts. This is most obvious in the action scenes such as the one I show above. I will return to this topic in my next Foxhole post where I will provide further examples including some drawn by Jack. “A Day at the Beach” is a well written script based on the premise of a soldier writing to his mother. 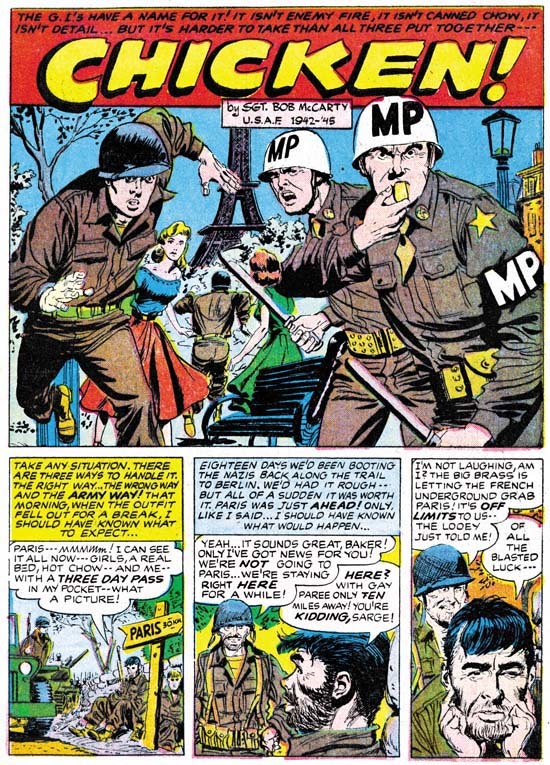 The irony of how the soldier describes to her what he is doing compared to what is actually occurring is nicely done. He is trying to convince her that he is safe but we know that he is anything but that. At the end of this story we see our hero marching off with his company in the direction pointed to by a road sign for Anzio. It is interesting that the writer of this story felt that such a simple reference would be sufficient for the readers. Even though those readers would have been too young to remember the actual events, I am sure the writer was correct to believe they would know about Anzio. Now after Korea, Vietnam and two Gulf wars I am not confident that many would recognize the name. I am ashamed to admit that although the name Anzio was familiar to me, I had to look up on the Internet to find out what it was about. Anzio was a controversial campaign by the Allies in Italy during World War II. Casualties were very high and not much ground was take. However the Germans were forced to divert much of their resources from the other Italian front and thus Anzio did help to bring an earlier end to the Italian campaign. Posted December 1, 2006 in 2006/12, 6 Mainline, Featured Work, Foxhole, Periods, Topic, z Archive. This was another cover selected by someone in the recent Featured Cover Contest as their favorite Simon and Kirby cover. I have previously commented on the general excellence of Mainline’s Foxhole covers. I noted that these covers particularly showed exceptional coloring and suggested that Simon or Kirby may have been more directly involved in producing the color guides. Foxhole #5 was published by Charlton but shares these characteristics. Although I describe it as a water coloring effect, Foxhole #5 looks like it was actually done by airbrush. Now if the color separation from the color guide was done by a photographic technique, this would suggest that perhaps Joe might have been responsible since he was adept at using the airbrush while Jack was not. However for comic books color separation was usually done by hand by someone at the printers. So the use of airbrush for the coloring of Foxhole #5 was likely not to have been done by Joe. Foxhole was the only real war genre that Simon and Kirby had produced. I exclude Boy Commandos because that is really more of a kid gang comic. It is regrettable that Mainline had failed as Foxhole along with Bullseye were really exceptional comics. That is not to disparage In Love or Police Trap, but S&K had done a lot of crime and romance work so the loss of those two titles is not as significant. 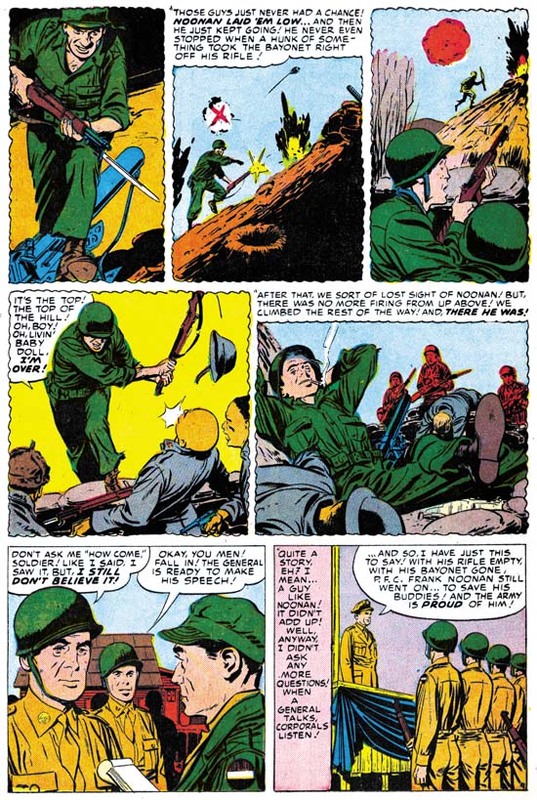 Regrettably the original Foxhole and Bullseye comics are pricey so it is unfortunate that they have not received the sort of reprinting that Boys’ Ranch and Fighting American had. Super Comics did do reprints of both in the 60’s but without the original covers. Some of these are still be found at reasonable prices and are well worth it even if there are not a lot stories actually drawn by Jack Kirby. Although S&K did not produce any war comics other then Foxhole, they were involved in covers for some of Harvey’s Warfront. I have posted on two of these covers (#28 and #29) in a chapter of The End of Simon and Kirby. Some believe that Warfront #30 and #34 were also drawn by Jack Kirby, but I am inclined to disagree. I have seen the original art for #30 and #34 and, like the cover art done by Kirby for Harvey romances, the art was done on Bristol board. This board is rather thin, unlike the thicker Illustration board that were previously used for Simon and Kirby productions. Interestingly the original art for Warfront #28 was also done on Illustration board. Further the art and especially the inking style is much closer to Foxhole and other Mainline comics. Particularly look how the lower leg and both forearms are spotted by large puddles of black that leave just small un-inked areas. Finally the #28 cover depicts a scene from a story called “Hot Box” published in Foxhole #2. Because of this I believe that the art for the cover of Warfront #28 was an originally unused one meant for Foxhole #2. The red lines on the original art were used to indicate limits to a colored area. The red lines were not supposed to show up as line art on the black plate, but somehow this was ignored when the cover was actually published. The positions of the two right planes and one bullet shell were shifted on the published cover. The brown stain is from rubber cement which suggests that the art once had something pasted in that position.